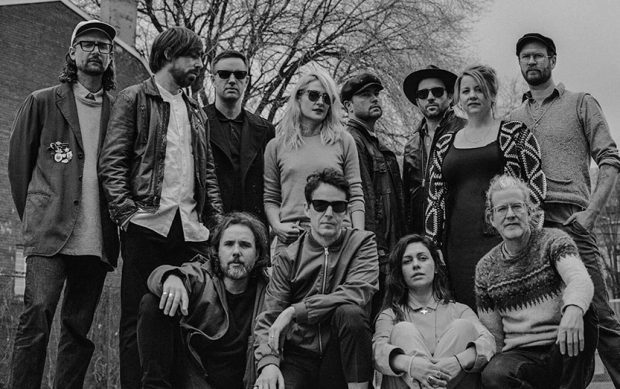 It has been seven years since Broken Social Scene‘s last album and now they have announced their latest release Hug Of Thunder will be out July 7. The Toronto based band have also shared the title track Hug Of Thunder which you can check out below and features the vocals of Leslie Feist. It follows the excellent first single Halfway Home a few weeks back. Hug of Thunder includes contributions by all 15 original band members plus new guest vocalist Ariel Engle. The band have come together occasionally over the past 4 years for the odd festival show, but the idea of a new album has been in the works since November 2014 when producer Joe Chiccarelli told Drew the group needed to produce a new album. The result is a 53 minute, 12 track album which manages to be both intimate and epic, discussing troubled times while still injecting positivity. Hug Of Thunder (the song) is out now while Hug Of Thunder (the album) will be out July 7.